Over the last three years, pharmaceutical companies have mounted a public relations blitz to tout new cures for the hepatitis C virus and persuade insurers, including government programs such as Medicare and Medicaid, to cover the costs. That isn't an easy sell, because the price of the treatments ranges from $40,000 to $94,000 - or, because the treatments take three months, as much as $1,000 per day. So to persuade payers and the public, the industry has deployed a potent new ally, a company whose marquee figures are leading economists and health care experts at the nation's top universities. The company, Precision Health Economics, consults for three leading makers of new hepatitis C treatments: Gilead, Bristol-Myers Squibb and Lake Bluff's AbbVie. When AbbVie funded a special issue of the American Journal of Managed Care on hepatitis C research, current or former associates of Precision Health Economics wrote half of the issue. A Stanford professor who had previously consulted for the firm served as guest editor-in-chief. Even as drug prices have come under fierce attack by everyone from consumer advocates to President Donald Trump, insurers and public health programs have kept right on shelling out billions for the new hepatitis C treatments, just as Precision Health Economics' experts have urged them. With a battle looming between the industry and Trump, who has accused manufacturers of "getting away with murder" and vowed to "bring down" prices, the prestige and credibility of the distinguished academics who moonlight for Precision Health Economics could play a crucial role in the industry's multipronged push to sway public and congressional opinion. While collaboration between higher education and industry is hardly unusual, the professors at Precision Health Economics have taken it to the next level, sharpening the conflicts between their scholarly and commercial roles, which they don't always disclose. Their activities illustrate the growing influence of academics-for-hire in shaping the national debate on issues from climate change to antitrust policy, which ultimately affect the quality of life and the household budgets of ordinary Americans - including what they pay for critical medications. The pharmaceutical industry is digging in, with one of its trade groups raising an additional $100 million for its "war chest." For years, it has spent millions of dollars lobbying politicians, hoping to enlist their support on a wide range of legislation. It has similarly wooed doctors, seeking to influence what they research, teach and prescribe. Now, it's courting health economists. "This is just an extension of the way that the drug industry has been involved in every phase of medical education and medical research," said Harvard Medical School professor Eric G. Campbell, who studies medical conflicts of interest. "They are using this group of economists it appears to provide data in high-profile journals to have a positive impact on policy." The firm participates in many aspects of a drug's launch, both advising on "pricing strategies" and then demonstrating the value of a drug once it comes on the market, according to its brochure. "Led by professors at elite research universities," the group boasts of a range of valuable services it has delivered to clients, including generating "academic publications in the world's leading research journals" and helping to lead "formal public debates in prestigious, closely watched forums." Precision Health Economics may be well-positioned to influence the Trump administration - Tomas Philipson, an economist at the University of Chicago and the third co-founder of Precision Health Economics, served briefly as a senior health care adviser for the Trump transition team. He did not respond to requests for comment. Scott Gottlieb, reportedly a candidate for commissioner of the Food and Drug Administration, is a clinical assistant professor at New York University School of Medicine and a former "academic affiliate" of Precision Health Economics. Although it's hard to gauge the firm's precise impact, associates of Precision Health Economics have often waded into the political fray. Last fall, big pharma spent more than $100 million defeating a California referendum that would have controlled the prices of both generic and name-brand drugs. Testifying in September at a state Senate hearing on a generic drug, co-founder Dana Goldman steered the discussion to name-brand drugs, such as the hepatitis C treatments, arguing that their prices should not be regulated. The U.S. grants drugmakers several years of market exclusivity for their products and remains one of the only industrialized countries that allows them to set their own prices. These protections have allowed the pharmaceutical industry to become one of the economy's most profitable sectors, with margins double those of the auto and petroleum industries. "Like other standard consulting projects, you can't publish unless you get permission from the company," the former employee said. Carolyn Harley, senior vice president and general manager of the firm, said that pre-publication review was not company policy, but "in some cases, client contracts provide them the opportunity for review and comment before submission." Said Lakdawalla: "I have never published anything that I am not comfortable with or prepared to defend, nor have I ever been asked to." The professors' disclosure of their ties to the firm and to the pharmaceutical industry in scholarly articles is inconsistent; sometimes extensive, sometimes scanty. Members of Precision Health tend to reveal less about their paid work in blogs, public forums like conferences, and legislative testimony. At the Capitol Hill briefing last May on hepatitis C drugs, Lakdawalla didn't mention his affiliation with Precision Health Economics, though it was listed in the journal issue, which was provided to attendees. "Conflicts are always a concern, which is why it is important to be transparent about study methods - that way they can be scrutinized and debated in the academic literature," said Lakdawalla, adding that he has disclosed his ties to the firm in at least 33 publications over the past three years. Goldman said he and other academics at Precision Health Economics disclose their ties whenever appropriate, but typically journal editors and conference sponsors decide how to make that information available. "I wear two hats," Goldman said in an interview. "And I try to reveal what that might mean in terms of perceived conflict of interest." The issues at stake aren't just academic. Goldman says that pharmaceutical companies need to reap financial rewards from the enormous time and expense they invest in developing better medical treatments. Yet the high prices of some drugs have left government health programs strapped, or forced them to limit coverage. For example, one promising hepatitis C treatment is so expensive that some state Medicaid programs have chosen to cover its cost for only the sickest patients. Despite such cases, four researchers from Precision Health Economics warned last month that any government controls on drug prices could actually shorten the average American's life by two years by discouraging development of new drugs. "As the pace of innovation slows, future generations of older Americans will have lower life expectancy relative to the status quo," they wrote in an article - funded by the pharmaceutical trade group PhRMA - published in the Forum for Health Economics & Policy, of which Goldman is the editor-in-chief and co-founder. More than half of the editors listed on its masthead are current or former consultants at the firm. Just after Goldman completed his Ph.D. in economics at Stanford in 1994, he was diagnosed with type 1 diabetes. He was 29. With a pump he wears every day, he takes insulin to treat the disease. "I would pay hundreds of thousands of dollars if I could take one pill that would make me better," Goldman said. The headquarters of Precision Health Economics sits in a West Los Angeles office building flanked by palm trees, about 10 miles from Goldman's academic center at USC. Goldman's assistant at USC is also an executive assistant at the consulting firm. Daniel Shapiro, director of research compliance at USC, said that both Goldman and Lakdawalla were in compliance with the university's standards on consulting. The list of associates has also included some policy heavyweights who recently left the government, including a top official from the Congressional Budget Office, a senior economist from the White House's Council of Economic Advisors, and an FDA commissioner. About 75 percent of publications by the firm's employees in the past three years have either been funded by the pharmaceutical industry or have been done in collaboration with drug companies, a ProPublica review found. Some academics worry that a tight relationship with industry might suggest bias. "I personally find, when your enterprise relies so substantially on a particular source of funds, you will tend to favor that source," said Princeton economist Uwe Reinhardt. Goldman says his industry connection has helped him ask better questions. "The right way to do these things is not to push away the private sector, but to engage them," he told ProPublica. "If we end up with a world where everyone who has a voice in a debate must be free of perceived bias, we lose the importance of the diversity of ideas." In a later interview, he added, "You have to separate the appearance of the bias with actual bias." These ideas were recently echoed in a piece he wrote with Lakdawalla for The Conversation. "To be sure, collaboration with industry supplements our income through consulting fees," they wrote. "But no matter who funds our research - foundations, government, or companies - we apply the same template to our work. The ivory tower is not always the best place to understand the social benefits of treatments, the incentives for medical innovation, and how aligning prices with value can aid consumers." In April 2015, Precision was acquired by the privately held biotech company Precision for Value. Terms weren't disclosed. Precision raised its profile in 2013 when the president's annual economic report cited a cancer study by several of the firm's principals and consultants. To some critics, though, the study showed how industry funding can taint academic research. As the study acknowledged, it was funded by Bristol-Myers Squibb, a company that at the time was developing a much-anticipated cancer treatment that was priced at more than $150,000 per year when it eventually came on the market. All three founders of Precision Health Economics were listed as authors of the Health Affairs article, alongside one of their employees, yet none of the founders disclosed their ties to their consulting firm in the published study. In an interview, Goldman said this might have been an "oversight." Goldman later e-mailed ProPublica to clarify that the journal was aware that the study was a Precision Health Economics publication and that Goldman and his co-founders were affiliated with the firm. Goldman has published more than 25 articles and letters to the editor in Health Affairs since co-founding Precision, and only five have listed the connection. "This affiliation is clearly not a secret and I include it where relevant," Goldman wrote in the e-mail. "The bottom line is that disclosure policies vary across journals, journal editors, and over time. Definitions of what is 'relevant' are also subject to their own judgments." Soneji was not alone in his criticism. Aaron Carroll, a pediatrics professor at the Indiana University School of Medicine, reviewed the methodology and concluded that the Precision researchers had used measure that can frequently be misinterpreted. Instead of relying on mortality rates, which factor in a patient's age of death, the study employed survival rates, looking at how long people live after diagnosis. Cancer screening, which can increase survival rates, is more frequent for some cancers in the U.S. than in other countries, Carroll says. The Precision team has defended their use of survival rates in a published response to the Dartmouth study, writing that they "welcome robust scientific debate that moves forward our understanding of the world" but that the research by their critics had "moved the debate backward." Precision has become a prominent booster of a new way of setting drug prices: based on their overall value to society. Value is determined by comparing the drugs' cost with their effectiveness in saving lives and preventing future health expenses. Pharmaceutical companies have traditionally justified their prices by citing the cost of research and development, but recent research on drug pricing has challenged this argument. Many of the largest drug companies spend more on sales and marketing than on developing their drugs. And notably, one researcher has found that about 75 percent of new molecular entities, which are considered the most innovative drugs, trace their initial research funding back to the government. "There is substantial evidence that the sources of transformative drug innovation arise from publicly funded research in government and academic labs," said Aaron Kesselheim, an associate professor at Harvard Medical School whose research looks at the cost of pharmaceuticals. Pharmaceutical pricing, he says, is primarily based on what the market can bear. Many early proponents of value pricing, including American health insurers, saw it as a way to rein in drug prices. Some nations, particularly those with national health systems, rely on official cost-effectiveness analyses to decide which drugs to pay for. Overpriced drugs are sometimes denied coverage. This powerful negotiating tool has helped keep drug prices down abroad. Efforts to establish similar practices in the U.S., however, have been stymied by lobbying from patient groups, many of them funded by the pharmaceutical industry, contending that value pricing could lead to rationing of health care. More recently, though, the industry has used academic consultants to help it redefine the concept of "value" to justify its pricing. At the congressional briefing on the new hepatitis C drugs, Harvard Medical School associate professor Anupam Jena, a Precision Health Economics consultant, suggested that part of a drug's value is earning enough profit that pharmaceutical companies are enticed to develop treatments for other diseases. Otherwise, Jena said, "you don't incentivize innovations that actually deliver value, and so the next cure . . . may not be developed." Princeton's Reinhardt said pricing drugs based on this notion of value could give the industry carte blanche to charge whatever it wants. "If you did value pricing and say it's okay for the drug companies to charge up to what the patient values his or her life to be, you are basically saying that the pharmaceutical companies can take your savings," he said. "American society will not stand for that." Not long after the controversy over its cancer research, Precision became embroiled in another academic spat related to a client's product. This time, it was over a breakthrough treatment that, injected one to two times per month, could help millions of Americans with high cholesterol. At the $14,000-per-year price set by one of its makers, Amgen, the PCSK9 inhibitor could also hike the nation's annual prescription drug costs by an unprecedented $125 billion, or 38 percent. Its price in the U.S. is twice as much as in the U.K. The U.S. price of the drug has come under vigorous attack from the nonprofit Institute for Clinical and Economic Review. ICER, which began as a small research project at Harvard Medical School, studies the cost-effectiveness of drugs, balancing their value to patients against the impact of their cost on society. The Centers for Medicare and Medicaid Services proposed a new rule in March 2016 that includes the use of value-based pricing studies, specifically citing the work of ICER. The industry has attacked many of the institute's studies, particularly those that find a treatment is overpriced. Some patient groups have contended that ICER emphasizes cost savings because it receives funding from health insurers. However, foundations are ICER's biggest source of funding, and it is also supported by the pharmaceutical industry and government grants. The pharmaceutical lobby has similarly attacked the Drug Effectiveness Review Project, a coalition of state Medicaid agencies and other payers, accusing it of using its studies to justify "rationing." ICER concluded in 2015 that the new cholesterol treatment, the PCSK9 inhibitor, should cost about one-fifth what Amgen is charging. A few months later, Philipson, the Precision Health Economics co-founder, and Jena wrote an op-ed in Forbes, citing the institute's research and deriding its approach to value pricing as "pseudo-science and voodoo economics." Only Philipson disclosed his ties to Precision Health Economics, and neither academic disclosed that Amgen was a client of the firm. After being asked by ProPublica about the lack of transparency, Forbes added a disclosure statement to the Op-Ed. "Manufacturers of PCSK-9 inhibitors and novel treatments for hepatitis C, such as Amgen, Gilead, and Abbvie, are clients of Mr. Philipson's consulting firm, Precision Health Economics, for which Dr. Jena also works," the publication noted. "In general, the pharmaceutical and biotechnology companies which retain Precision Health Economics benefit from higher drug prices." Goldman, along with Precision employees and two Harvard professors, including Jena, published their own study on the cholesterol drug in the American Journal of Managed Care, where Goldman serves on the editorial board. They found that the new cholesterol drugs were indeed cost-effective at the listed prices. The article disclosed the authors' ties to Precision Health Economics and the source of funding: Amgen. ICER's finding that the PCSK9 inhibitor was overpriced was later affirmed in a related study published in the peer-reviewed Journal of the American Medical Association, or JAMA. Associates of Precision again rushed to Amgen's defense. Philipson and an Amgen executive wrote a letter to the editor of JAMA to dispute the study's conclusion that the price should be about $4,500 per month, less than a third of the drug's average price. The two studies made different assumptions that shaped their conclusions. Dhruv Kazi, one of the authors of the JAMA study and an associate professor at the University of California San Francisco, said that the Precision Health Economics study assumed that there were fewer eligible patients who would take the drug, lowering the cost to society. It also posited that they had a higher risk of cardiac events, like heart attacks, boosting the drug's value as measured in lives saved. Jena said the patient population for the Precision study more accurately reflected the real world. And that one should not automatically assert that a study is "invalid or flawed" because of industry funding, he added. The JAMA study "over-exaggerated the cost" of the drug and "unnecessarily rang 'alarm bells,'" said Amgen spokeswoman Kristen Neese. Amgen has ties to all three founders of Precision Health Economics. Working for other firms, Philipson has twice testified as an expert witness for Amgen, defending the company's rights to drug patents, according to his curriculum vitae. The other two founders, Goldman and Lakdawalla, are principals at the Leonard D. Schaeffer Center for Health Policy and Economics at USC, which received $500,000 in late 2016 from Amgen for an "innovation initiative," according to public disclosures. Goldman said the funds were unrestricted and could be used at the center's discretion. Robert Bradway, the CEO and chair of Amgen, is on the advisory board of the university center, and Leonard Schaeffer, a professor at USC and the namesake of the center, sat on Amgen's board of directors for nearly a decade. "We know that the pricing of these treatments is often controversial," he told the crowd of policymakers, which included Sen. Bill Cassidy (R-LA), a physician who sits on the Health, Education, Labor and Pensions Committee. "If we dropped all the prices today, in the long run, we wouldn't have any innovation." Gilead Sciences' $84,000 list price for its highly effective treatment for the hepatitis C virus prompted dozens of state Medicaid programs and prison systems to restrict treatment to only the sickest patients. A congressional investigation in 2015 found that Gilead, which purchased the drug from a smaller pharmaceutical company, had set the price of the treatment at the peak it thought the market could bear, more than double what the drug's original developers had suggested. "Gilead pursued a calculated scheme for pricing and marketing its hepatitis C drug based on one primary goal, maximizing revenue, regardless of the human consequences," said Sen. Ron Wyden (D-OR)., when he presented the findings of the congressional investigation. While Precision Health Economics often portrays itself as an advocate for wider access to vital medications such as the hepatitis C drugs, the high price of those drugs forces some payers, such as the Medicaid programs, to ration them. As a result, the professors may influence who ultimately gets the drug and who doesn't. The impact is reverberating in the rugged hills of eastern Tennessee, where hepatitis C is spreading due to the opioid epidemic. Because the virus can be asymptomatic for years, only a fraction of those infected know they are carriers, leading many to spread the potentially fatal liver disease unknowingly, mostly by sharing needles. Over the past seven years, the number of acute cases of hepatitis C in Tennessee has tripled. The state has estimated that more than 100,000 residents are likely to have a chronic version of the disease without realizing it. Just last year, the state issued a public health advisory addressing the crisis, but the rates of infection continue to rise. She didn't believe the letter at first, hoping they had mistaken her blood with that of another donor. After all, she had never experienced any symptoms. But a local doctor re-ran her blood work and her diagnosis was confirmed. Like many in her community, Scott, 26, had battled an addiction to drugs, mostly painkillers, and she had used syringes in the past for her highs. She'd been clean for the past four years but believes that she contracted the disease through her drug use. "I made some mistakes," said Scott. "But I didn't ask to be sick." Raising two sons on her own, Scott barely supports the family with her weekly income of about $350 from sewing shirts at an apparel factory. She is one of more than 11,000 Tennesseans on Medicaid who have been diagnosed with hepatitis C, according to the most recent state data. If all of them received the new medication, the state estimated that it would cost over $1.6 billion, more than double what Tennessee's Medicaid program spends on drugs in a year. Under this policy, less than 10 percent of diagnosed Medicaid patients have been treated, still costing the program more than $100 million in the past two years. Patients like Scott, whose liver has no significant scarring, were forced to wait for the disease to progress before being prescribed any of the new drugs. The state denied Scott's request for the cure in March 2016. But she wouldn't let that stop her. She appealed and was granted a hearing in Knoxville, which she had to attend by phone because it was a two-and-a-half hours' drive from her home. She explained to the judge that she was a single mother of two young boys and could not risk her health declining. A few days later, she received a court order in the mail, denying her access to the treatment. 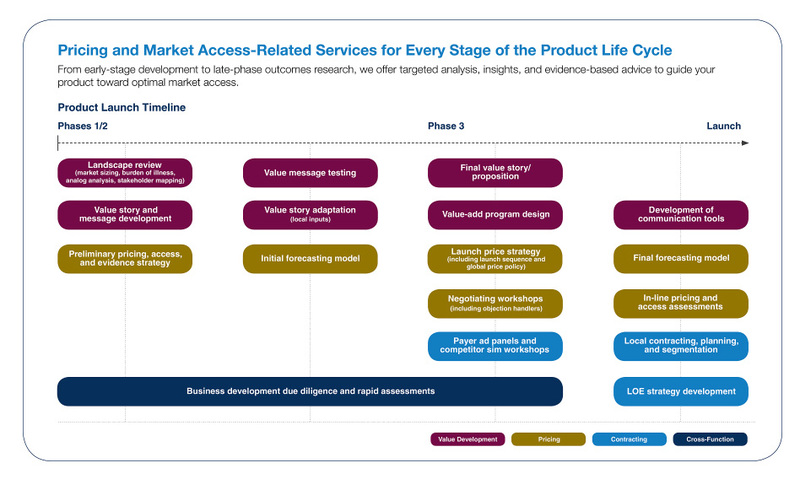 On its website, Precision for Value lays out how it can help biotech companies with "preliminary pricing, access, and evidence strategy" and "launch price strategy." The company says that it can "pressure test" a company's proposed messaging strategy on value with key stakeholders and determine how willing the market might be to pay future drug prices. Under its new ownership, Precision recently launched a group focused explicitly on assessing the value of innovative drugs. The firm's three founders are involved with this Innovation and Value Initiative, which bills itself as an "unparalleled convergence of academic leaders and scientific experts." Lakdawalla serves as executive director of the initiative. On the initiative's health advisory panel, which is supposed to steer the research agenda, Goldman and Philipson sit alongside mostly executives from pharmaceutical companies and trade groups. The initiative also has a scientific advisory group for internal peer review. All of its members are current or former Precision consultants or staffers. Lakdawalla said in an e-mail that all of its projects "either undergo academic peer review at a journal, or include an external peer reviewer outside [the firm]." To promote the new initiative, Precision has launched an extensive advertising campaign, sponsoring content in Health Affairs, writing Op-Eds in the Washington Post and Forbes, and even buying ads on Google. In a phone conversation, Goldman was asked whether the stratospheric drug prices bolstered by the professors at Precision deprive low-income patients, like Emily Scott, of vital treatments. He responded that it's important to take a longer-term view.